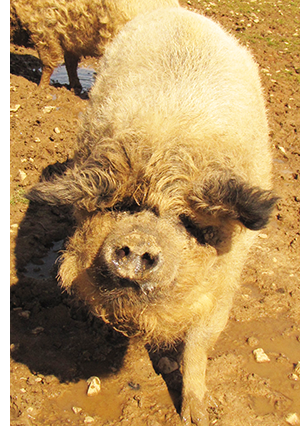 Welcome to the website for Otterburn Mangalitza - the North Yorkshire home for pure breed Mangalitza pigs in the United Kingdom. Originally from Hungary, Mangalitza reach their 'prime' at 2 years of age and neither the meat nor fat quality depreciate over time. Otterburn Mangalitza's have an unmatched reputation for quality, borne out by their high-profile clientéle and the growing global export demand. We rear our pigs to a minimum of 2 years, to ensure that they are the absolute best that they can be and, importantly, to give each animal a longer and happier life. Please explore our website to discover more about this wonderful breed and also about ourselves. Clients include London restaurants such as Chamberlains, Kitchen W8, Petrus and Nobu, whilst our black pudding has been a favourite with customers at Shangri-La in the Shard, also in London. We also export, pigs for both breeding stock as well as meat.